Crispy Chilli Baby Corn Recipe | Baby Corn Snacks | Cook Click N Devour!!! Chilli baby corn recipe– A very crispy baby corn starter recipe with just very few ingredients. Chilli baby corn is one of the popular baby corn snacks recipes from Indo chinese cuisine. Do try this out as snack or starter! Crispy chilli baby corn recipe with step wise photos. Today I am sharing an easy baby corn starter recipe with you all. This crispy chilli baby corn is one of the popular baby corn snacks from Indo Chinese cuisine just like gobi manchurian, baby corn manchurian, chilli potato, crispy corn recipes. Indo chinese chilli recipes are especially popular among Indian street foods. This is a very easy recipe for crispy chilli baby corn. Usually these kind of starter recipes call for deep frying. But as you know me well that I always opt for shallow frying whenever I can. Here also I have shallow fried the baby corn in this easy baby corn recipe. Baby corn especially tastes very crunchy even while shallow fried. The quantity of corn flour should not be reduced as it makes the baby corn very crispy. If you want to retain the crispiness of baby corn for a long then use rice flour instead of corn flour. All indo chinese chilli dish tastes good when made a bit spicier. Making chilli baby corn recipe is easy with just few ingredients. 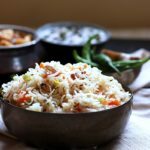 You can prepare this as snack or also as side dish for veg fried rice and noodles. This snack is always a great hit especially with toddlers and kids. Further more this crispy baby corn chilli will be a great party starter. Here I have par boiled the baby corns for just 2-3 minutes. If you cook for more time the baby corn will loose their crunchiness. The other ingredients that go into the making of this easy baby corn recipe are the usual fare, ginger,garlic,soy sauce,salt,pepper and sugar. Do try this simple crispy chilli baby corn fry recipe and tell me how you liked it. Finally if you are looking for easy indo chinese recipes do check idli manchurian, chilli okra, chilli paneer recipes. 1. First of all peel and chop the baby corn into 1 inch pieces. 5. In the same pan retain 2-3 teaspoons oil. Saute ginger and garlic till nice aroma wafts out. Add green chillies and saute. 6. Next add chopped spring onion whites and saute for 3-4 minutes. 7. Then add the cubed bell peppers and saute for 3-4 minutes. 8. Now add soy sauce,sugar,pepper powder and mix well . Cook in high flame for 2-3 minutes. 9. Finally add fried baby corns,toss well and serve crispy chilli baby corn hot immediately. If you’ve tried this chilli baby corn recipe or any other recipe on the blog then don’t forget to rate the recipe and let me know how you got on in the comments below. I love hearing from you! You can also FOLLOW ME on FACEBOOK, TWITTER, INSTAGRAM and PINTEREST to see more delicious food and recipes. Chilli baby corn recipe, learn how to make this simple,tasty,flavorful and easy indo chinese starter recipe, crispy baby corns tossed in a sweet and spicy sauce along with cubed bell peppers,one of the very easy baby corn recipes. Peel and chop the baby corns into 1 inch pieces. Par boil the chopped baby corns for 3-4 minutes. Drain and wipe gently with a kitchen towel. Take both the flours,salt and pepper in a mixing bowl. Mix well and add the cut baby corns. Shallow fry the batter coated baby corns in hot oil until golden brown. Drain and set aside till we make the sauce. Add the spring onion whites and saute for 4-5 minutes. Add the cubed bell pepper and saute well in high flame for 3-4 minutes. Add soy sauce,salt,sugar,pepper powder and mix well.Cook for 3-4 minutes. Add the fried baby corns and toss well. Garnish with spring onion greens . Serve crispy chilli baby corn immediately. 1. You can 2 teaspoons tomato sauce along with soy sauce for more sweet taste. 2. You can deep fry the baby corns too. 3. You can use rice flour instead of corn flour. Love this easy crispy chili baby corn recipe. I love indo chinese recipes.